WHAT MAKES THE TRILOGY WORTH THE INVESTMENT? The TRILOGY is not just a sand blaster. The TRILOGY is the package. The HELIX nozzle is a patented system that allows for a wide range of applications. The helical vortex produced from the nozzle in combination with media flow and air pressure adjustment capability, allows for gentle removal of surface contamination on any masonry or wood surface without damaging the surface. As a result, the unit has been certified for historic restoration, while also being adaptable to produce strong abrasive powers. The technology allows its users to maximize surface protection and performance by 30% (in comparison to the eco-blaster). The HELIX offers convenience to its users by operating as a dry or wet system. This is accomplished by attaching a hose to the equipment with easy access from the gun to allow for desired flow. The ECO BLASTER nozzle offers a certain range of applications that helps to complete the overall package of the trilogy. 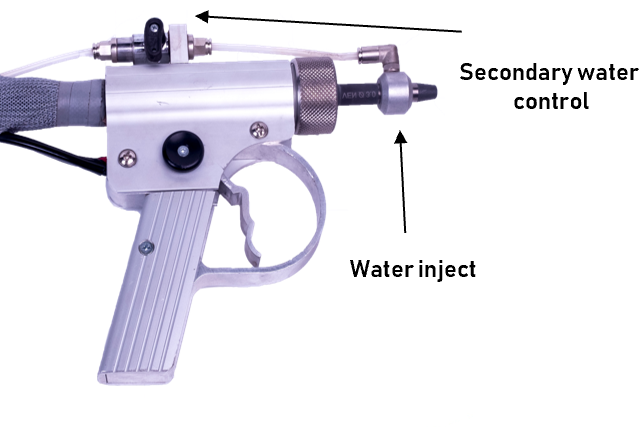 This gun can easily be interchanged with the Helix nozzle as quick connects are installed. This unit offers effective stripping powers. The air flow produced from this nozzle mimics that of a traditional sandblaster but still offers its users gentle removal of surface contamination. This nozzle works well for removal of paint on metal surfaces, rust removal, etc. For historic restoration please refer to the Helix nozzle. Like the HELIX nozzle, the ECO Blaster offers convenience to its users by operating as a dry or wet system. The TRILOGY comes in various sizes to fit a wide range of needs. If you need extreme portability, the TRILOGY Nano and 9 offers you lightweight equipment that requires very low CFM’s to operate. If you need portability and volume, the TRILOGY 28 offers you a larger chamber while still remaining lightweight and low CFM’s requirements. If you need volume the TRILOGY 40 will meet you needs. 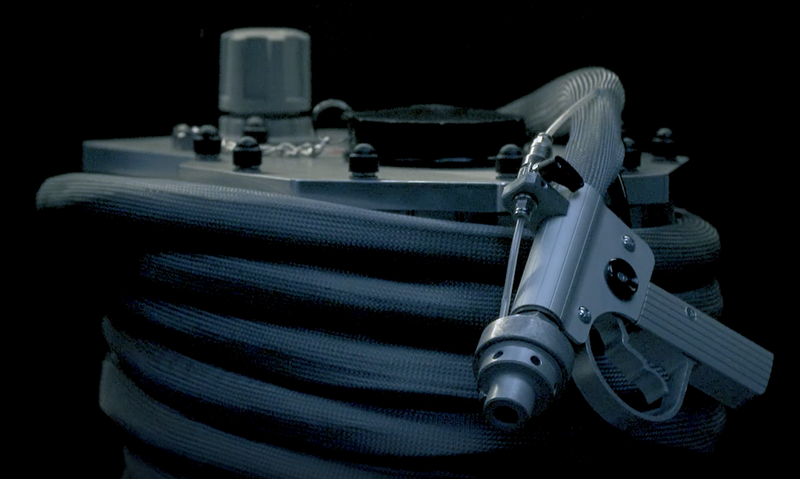 The TRILOGY Nano-9-28 have smaller compressor requirements then traditional sandblasters. Trailer compressors that produce 185 CFM’s or higher are not required to operate the equipment. Our sandblasters can operate on as little PSI as 3 up to 123. We offer a line of compressors that are suitable for our equipment. The TRILOGY is forged out of lightweight aluminum, making the system extremely portable. The equipment can easily be transported to and from job sites and even up scaffolding. 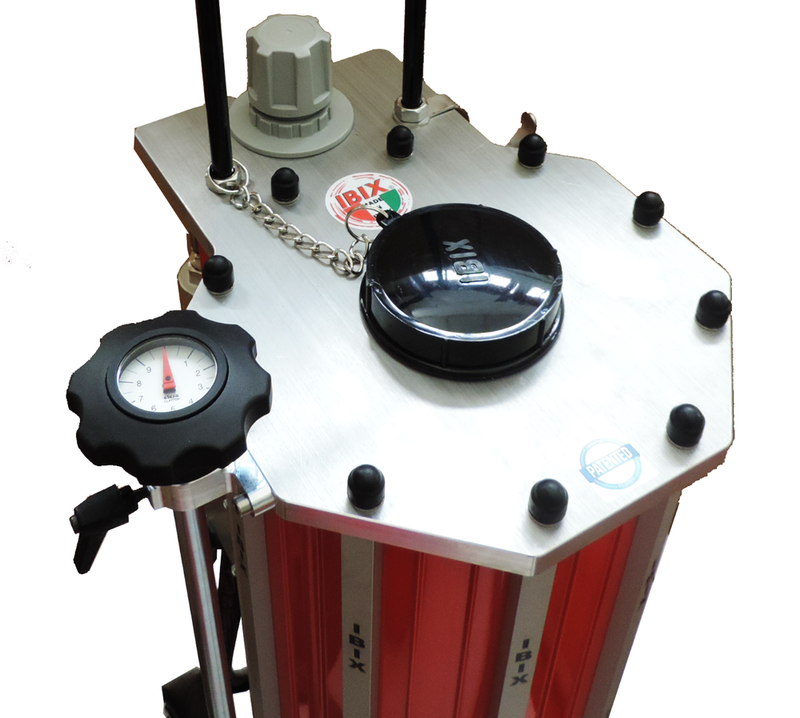 The TRILOGY nano-9-28, followed by the required compressor can fit nicely into the back of a van or truck. The TRILOGY does not limit you to certain grades of media. IBIX offers a range of environmentally-friendly media that can be used to clean a large variety of surfaces. By connecting a garden hose to the pot, you can operate both the HELIX and ECO Blaster nozzles with water. You can control the flow of water at the nozzle to create a dust free work environment or to create optimal cleaning solutions for gentle removal of surface contamination. Whether it be to improve ergonomic posture or to comply with job specifications, we’ve got you covered. In conjunction with the media flow attachment, the mobile app offers its users peace of mind. Simply input your surface type and type of contamination being removed and the software will provide you a detailed output. It will suggest what air pressure to be use, the level of media flow and how long to clean a square meter. There is also a section to input media cost/labor cost to help you price out jobs. WHAT SURFACE ARE YOU RESTORING?